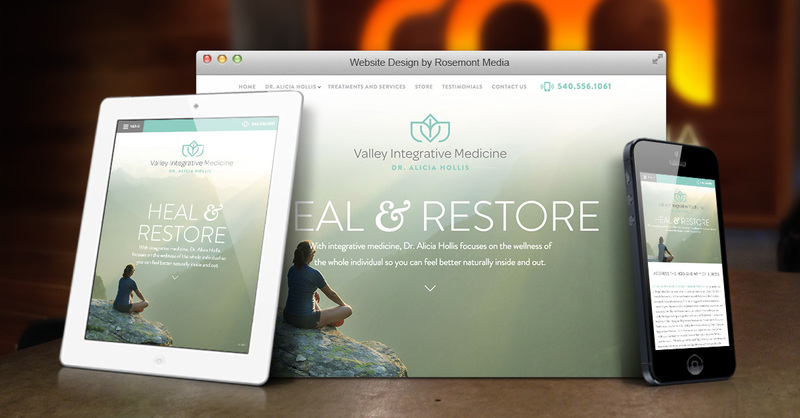 When Dr. Alicia Hollis of Valley Integrative Medicine sought the help of our team at Rosemont Media, she wanted a state-of-the-art website complete with dynamic marketing features, an elegant look, and educational patient resources. Our design team integrated the essence of her Roanoke integrative and functional medicine practice by visually depicting the freedom and vitality optimal wellness and a healthy lifestyle can provide. The luminous natural imagery, modern website design elements, and intuitive navigation create the perfect balance between beauty and functionality. In order to reach a more expansive range of potential patients, the website features a responsive design and advanced medical SEO. While the responsive design enables the website to adjust to a variety of mobile and desktop screen sizes, SEO helps those searching the web for integrative health services in Roanoke to more readily discover Dr. Hollis. Once reaching the site, web users can easily explore the well-organized custom content for helpful information, purchase recommended nutritional supplements, and contact the practice to schedule an appointment. To see the results of our work with Valley Integrative Medicine first-hand, we invite you to visit www.draliciahollis.com. We strive for excellence in medical website design and can provide your practice with a custom website package that exceeds your expectations.